Classic boy names stand the test of time. Whether the year is 1918 or 2018, at least some of our sons will answer to evergreen names like Charles and Thomas. 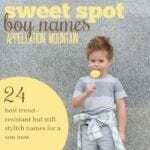 Ask parents their preferred style, and plenty will tell you that classic boy names are their go-to. And yet, what makes a true classic? 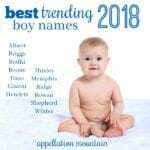 Only around a dozen names have never left the US Top 100 – because yes, even classic boy names are subject to trends. If this list relied solely on the numbers, we’d have to exclude traditional favorites like Henry and Alexander. Claim a long history of use, even if they’re not always top of the charts. Can be found throughout history, from the ancient or medieval to the modern era. The names could easily belong to a newborn baby, or his grandfather – or great-great-grandfather. Avoid nickname forms. While many shortened versions of names have been around for ages, it’s the most evergreen version of the name that makes this list. Travel across languages. If a hallmark of a name’s classic status is a long history of use, it should be familiar in other countries. Feel at least slightly stylish today. I could argue that Dennis and Howard belong on this list – but many seem more like neglected traditionals than classic boy names. 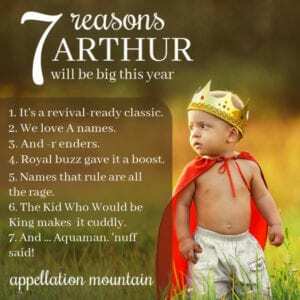 If you’re naming a son and prefer something timeless, this list is for you! The very first man in the Biblical Garden of Eden, Adam simply means man – or might refer to the earth from which he was shaped. While the name peaked during the 1980s, it doesn’t feel like an 80s name. Famous Adams include West, who played Batman during the 1960s, and Maroon 5 frontman Levine, born in 1979. Fictional Adams span the ages, too. Spencer Tracy wore the name in 1949 comedy Adam’s Rib. The current Disney Channel line-up gives us a teenaged Adam on Lab Rats. The name works in every generation. Read more about Adam here. Ancient Alexander conquered the known world. Centuries later, it reigned in the US Top Ten for nearly a decade. In between, plenty of famous men answered to the name, from athletes to inventor Graham Bell, and founding father Alexander Hamilton – now the star of a wildly successful Broadway musical. Most Alexanders answer to Alex, but options abound. It’s more popular today than it was a century back, probably thanks to the X factor. A New Testament name, Andrew was a fisherman-turned-apostle. He’s the patron saint of Scotland, lending this name a certain Scottish vibe, where it remains quite popular. In the US, the name has never left the Top 100. Famous figures range from industrialist Carnegie to artist Wyeth, along with a generation of 20-something Andrews. Some, like The Office’s Andrew Bernard prefer Andy, though Drew became the more modern go-to for many. Still, they’re both friendly, wearable short forms, and Andrew in full is quite handsome, too. Mark Antony makes this name ancient; two popular saints made it widely used throughout the Middle Ages and into the 21st century. It feels both sophisticated and British (think Welsh actor Anthony Hopkins) and accessibly Italian-American, though usually shortened to Tony (think Danza). But really, the name spans the globe. Jeremy and Zachary has risen and fallen, but Anthony remains a Top 100 favorite, putting it with the classic boy names. I’ve yet to write about Anthony! When the post is complete, I’ll update it here. Legendary Arthur ranked in the US Top 100 through the 1960s. No wonder we can name so many famous men by the name: playwright Miller, Sherlock creator Conan Doyle, tennis great Ashe. King Henry VII of England gave the name to his first-born, but he died before ascending the throne. Instead, King Arthur brings to mind all of the pageantry and story of the Knights of the Round Table. The name strikes a nice balance – it feels substantial and serious, but also romantic. Today it remains relatively underused, but is poised for a revival. Benjamin recently entered the US Top Ten, making it more popular than ever before. 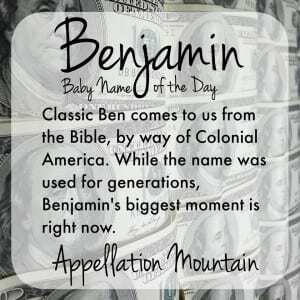 A long list of Ben names promises to follow, too, from Bennett to Benicio. And yet, Benjamin is no newcomer. The Old Testament name belonged to the youngest of Jacob’s twelve sons. It features prominently in US history, thanks to entrepreneur, inventor, and statesman Benjamin Franklin. Read more about Benjamin here. Quick – name a Charles! From Darwin to Dickens, Barkley to Brown, chances are that you know a dozen. Nicknames abound for this classic choice. A Germanic name, the early medieval ruler Charles the Great went down in history as Charlemagne. It’s been in use throughout Europe ever since. American parents sometimes prefer to put friendly nickname Charlie on the birth certificate instead, but Charles remains the evergreen classic. Christopher hit it big in the 1960s, entering the US Top Ten and remaining there until around ten years ago. It’s why we can rattle off actors (Pratt, Evans, Pine). It almost feels like a dad name – think of The Gilmore Girls’ Christopher Hayden – but then there’s Christopher Robin, which makes this part of timeless children’s literature, too. Kit serves as another possible nickname, freshly popularized by Kit Harington of Game of Thrones fame. Read more about Christopher here. Read more about Daniel here. Another Hebrew name, David carries an appealing meaning: beloved. In the Old Testament, young David triumphed in battle against impossible odds against the giant Goliath, making this name inspiring and heroic. And, of course, notable Davids include the late musical icon David Bowie, which lends this name a strongly creative vibe. Factor in the ‘v’ of popular names like Levi and Everett, and there’s a case that David feels every bit as fresh today as any classic name ever could. Despite pop culture references aplenty – Scissorhands, Cullen – Edward has languished beyond the Top 100 for nearly two decades. That doesn’t tarnish the name’s classic boy names status. An Old English name worn by several Kings of England and plenty of other historical figures, Edward brings to mind creatives (Albee, Norton, Gorey, Hopper) as well as Ted Kennedy (born Edward Moore) and composer Edward Elgar (of Pomp and Circumstance fame). It’s a fits-in/stands-out pick that shortens to Ed, Ned, Ted, or Eddie, and wears beautifully in full. Read more about Edward here. Lately we’re loving longer boy names, like Sebastian and Oliver. So why not the enduring Frederick? The English form of a Germanic name, it combines classic appeal with the friendly nickname Freddie – currently a Top 20 choice in the UK. European rulers answered to Frederick; so did abolitionist Frederick Douglas, architect Frederick Law Olmstead (designer of Central Park in New York City), and dashing dancer Fred Astaire. 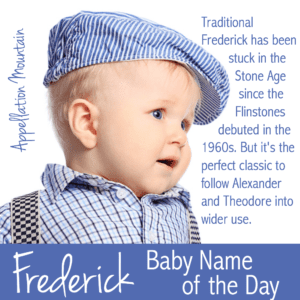 If you love the classic boy names on this list, but feel like many are too familiar, Frederick could be the one for you. Read more about Frederick here. George was a Top Ten favorite in the US into the 1930s. 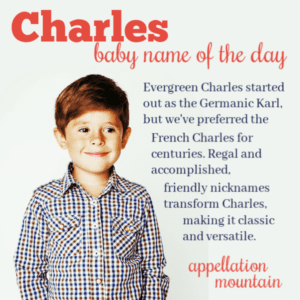 A century later, this classic boy name is climbing the charts again. Much credit goes to the young British Prince George. But there’s also dashing actor Clooney, three American presidents, and Star Wars creator George Lucas. With a short, distinctive sound, there’s something solid about George. It’s a reliable kind of name. And yet Georgie and Geordie make for sweet childhood nicknames, every bit as playful as Charlie or Jack. I sometimes call Henry stylish or trending, only to hear others object that Henry belongs with the classics. Both are correct! Henry has never left the US Top 1000, but it fell into the mid-100s in the 1980s and 90s. That seems quite neglected for a former Top Ten favorite. But then parents rediscovered this handsome, regal name, and Henry started to rise. Over a dozen celebrities chose it for their sons, and the name has doubled in use in under a decade. Read more about Henry here. Count James among the few boy names never out of the US Top 20. The New Testament name has long been popular throughout the English-speaking world, worn by saints, kings, and super-spy James Bond. Nicknames Jimmy and Jim feel midcentury, while Jamie – or better still, James in full – are quite stylish today. Given the name’s long and steady use, you can find an accomplished James in nearly any field, from the ever-cool James Dean and James Brown to six American presidents. For decades, John served as the go-to name for boys in the US. And while some probably answered to Johnny (Carson) or Jack (Kennedy), that still left an awful lot of Johns. Today, it’s the kind of traditional name some parents avoid. And yet, in a sea of Noahs, Liams, and Bens, John might sound fresh and surprising. From John the Baptist to John Lennon, plenty of meaningful associations attach to this handsome, straightforward name. One interesting note: add up Jackson, Jax, and international variants like Ian, and you might argue that John is still the #1 name in the US – or at least the most influential. We’ve all heard someone called a “regular Joe.” That’s probably because Joseph is one of three classic boy names consistently ranked in the US Top 20. You know a Joe – we all do. But that shouldn’t detract from Joseph’s traditional status. Significant bearers of the name appear in the Old and New Testaments, and many men of accomplishment have answered to the name. There’s baseball’s Joe DiMaggio, Nobel Prize-winning economist Joseph Stiglitz, and … well, it’s a long list. No question Joseph belongs with classic boy names. Read more about Joseph here. One hundred years ago, Louis reigned, a Top 50 choice through the 1930s. Then things changed, and Louis retreated. Still, a long history of use makes this a flawless member of the classic boy names’ club. The Germanic Ludwig was whispered down the alley, via Latin, into the French Louis. They pronounce it Louie; so do lots of people, but in the US you’ll also hear Louis said like Lewis. Louis Armstrong makes it musical, even though a future generation of parents will probably think of One Direction’s Louis Tomlinson first. 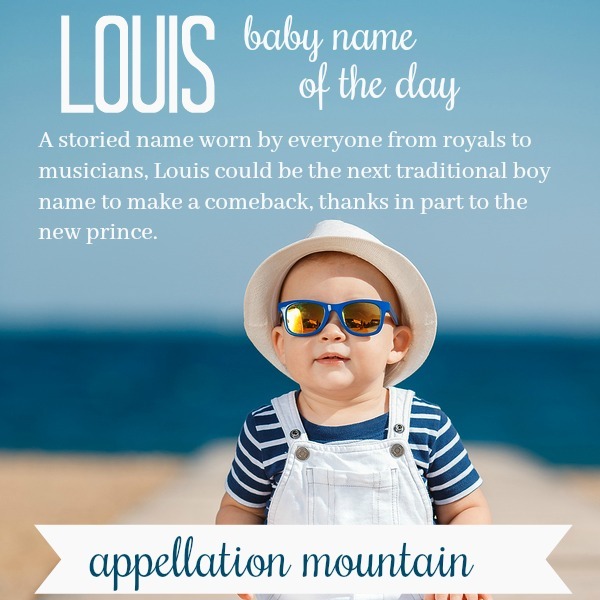 18 kings of France answered to the name, and Prince Louis Arthur Charles of Cambridge cements this name’s classic status. The lightsaber-wielding hero of the original Star Wars trilogy helped take this name from saintly and classic to current and cool. And yet Luke lost none of its timeless appeal. 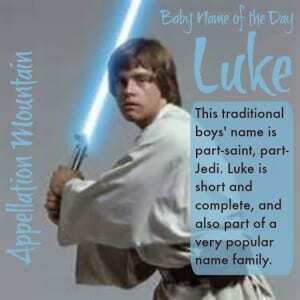 The New Testament name became Lucas in Latin, and both qualify as classic boy names. But Luke feels like the bolder option, one-part cowboy (think Cool Hand Luke), one-part superhero (think Luke Cage), and topped off with Jedi courage, thanks to Skywalker. Matthew travels effortlessly across international boundaries, picking up an ‘o’ in romance languages, an -ias in Dutch and German, an -eusz in Polish and an -ieu in French. The list goes on, with the first syllable remaining constant across borders. 1950s radio series-turned-television show Gunsmoke made the name feel rugged and capable, and it’s ranked in the Top Ten ever since. If two-syllable, ends-in-n boy names with surname style are all the rage, why hasn’t Martin caught on? It comes from ancient Rome, derived from Mars, god of war. That ancient status should be another plus; so should legendary figures like civil rights activist Martin Luther King, Jr. It’s well-used across the world and still feels like a classic pick in the US. With names like William and Henry so popular, there’s plenty of space for classic boy names like Martin to wear well. Read more about Martin here. Angelic Michael held the #1 spot in the US from the 1950s through the 1990s. We all liked Mike; actually, we still do – the name has been in the US Top Ten since 1943. Jackson and Jordan, Phelps and Strahan, Michael Scott, Mike Brady. It’s ubiquitous. 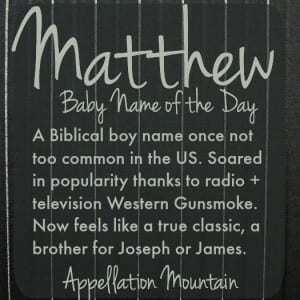 And yet it remains solid and handsome, a classic boy name with Biblical roots and an all-American vibe. Nathaniel feels like a Colonial Cool name, an export from an earlier historical era. Like many classic boy names, Nathaniel’s Biblical origins aren’t immediately obvious, though it is an Old Testament name meaning “God has given.” Author Hawthorne makes it literary, and short forms Nat and Nate lend it a brisk, modern feel. 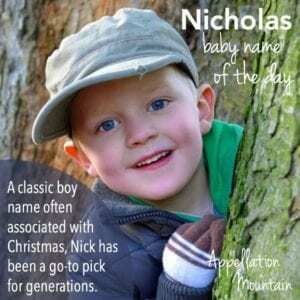 A storied name with centuries of use, Nathaniel fits nicely with classic boy names. Read more about Nathaniel here. Nicholas peaked in the 1990s, meaning a lot of young adults answer to Nick. And yet, plenty of men have worn the name in nearly any age. Credit a popular saint – the basis of our Santa Claus legends – for at least some of the name’s enduring charm. Think of Nicolas Cage or Nick Drake. Nicholas Bayard served as mayor of New York City was back in the 1600s – his family tree includes six US Senators. Bestselling author Nicholas Sparks also predates the Nick wave. Updated nicknames include Cole and Nico, though Nick remains classic and cool. Read more about Nicholas here. Upbeat Patrick became a favorite in the 1960s, but parents eventually tired of the nickname Pat. Today Patrick probably won’t be shortened – think of actor Dempsey. Patrick Henry makes it patriotic and Americana, and basketball Hall-of-Famer Patrick Ewing pushes it in an athletic direction. The name means nobleman – patrician – but to most, it brings to mind Ireland. No one can quarrel with Patrick’s classic status, but it’s far less common than many an evergreen favorite. Read more about Patrick here. Rabbit. Parker. Pan. We all grew up with Peter, from the curious bunny to the action hero. Today, Peter feels slightly unexpected; vintage, even. And yet this name belongs with the classic boy names. In New Testament, Jesus gave this name to his most faithful apostle, the rock upon which he built his church. Pete Townshed makes it rock ‘n’ roll; Bob Marley’s bandmate Peter Tosh takes it in another musical direction. Easy nickname Peter feels every bit as friendly as Charlie or Jack. The Normans brought Robert to England, and this Germanic name has been popular amongst English-speaking parents ever since. In the 1920s, Robert replaced John as the #1 name for boys born in the US, the only non-Biblical boys’ name to hold that lofty spot. Nickname Bob sounds like your great-uncle, but Rob seems perfectly reasonable for a boy born today. From Redford to DeNiro to Downey Jr., Hollywood gives us plenty of handsome Roberts – and that’s only in one field of endeavor. Read more about Robert here. Many of the classic boy names come with a Founding Father, and Samuel is no exception. Sam Adams started out as a politician – and sometimes brewer – back in Colonial Boston, hence the beer named in his honor. Another Old Testament name, Samuel caught on post-Protestant Reformation. The name has left the US Top 100, and seems poised to return to Top 20 status. A brother for Max or Ben, Sam feels classic, but down-to-earth, too. Read more about Samuel here. Simon long seemed like a classic British boy name, but slightly out of step in the US. Lately, Simon has regained his classic status on this side of the Atlantic, too, even though the numbers are mostly unchanged. Around 1500 boys received the name over each of the last five years. And yet, lately parents are considering Simon as a brother to – or substitute for – classic boy names like Henry and James. The New Testament name claims a long history of use and popularity throughout Europe, earning it a spot on this list. 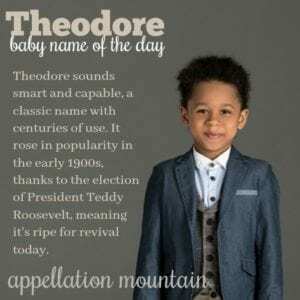 With o-ending boy names so popular, and many parents opting for longer traditionals, Theodore feels like an obvious choices. Upbeat nickname Theo – or friendly Teddy, if you prefer – seems right at home with Leo and Milo. But Theodore fits with longer classic boy names like Alexander or Benjamin. Factor in an American president by the name, author Dreiser, poet Roethke, and even Dr. Seuss – born Theodor Geisel – and this name sounds smart and capable. Read more about Theodore here. A New Testament name, we know Thomas best for his doubts – he wasn’t immediately convinced of Jesus’ resurrection. 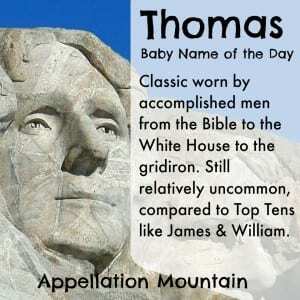 Like many classic boy names, Thomas feels less religious than many a modern favorite. Every-guy name Tom fits with Jack, Ben, and Sam, but just like Matthew and Patrick, plenty of 21st century Thomases use their name in full. From Founding Father Jefferson to Edison and Hanks, men of accomplishment abound. Read more about Thomas here. William has been worn by kings of England – present and future – but still feels accessible. William the Conqueror brought the name to England. Shakespeare makes it literary; figures like Tell and Wallace make it heroic. It’s far from the only Will name – Will Smith is really Willard – but it’s the most enduring of them. The name is one of just three to never leave the US Top Twenty, and now William short form Liam ranks in the Top Ten, too. Read more about William here. Looking for a strong classic for a son? 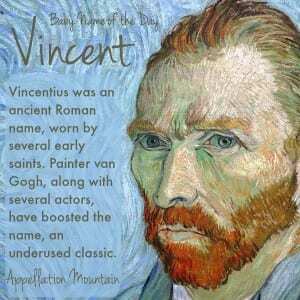 Vincent comes from the Latin meaning “to conquer.” Several saints wear the name; so does legendary artist Vincent van Gogh and renowned football coach Vince Lombardi. Entourage’s Vincent Chase reminded us how very handsome Vince can be. The name has dipped in and out of the Top 100 over the years, but remains a steady, staple choice. Read more about Vincent here. 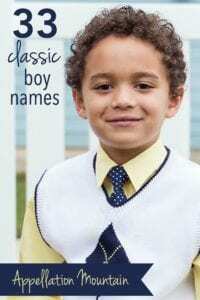 Would you consider any of these classic boy names? What would you add to the list? The one I thought of that I was a little surprised not to see was Jacob or maybe even Paul. Great list, what about girls! I feel like girls names are more trendy where as boys are more classic over time. I’d love a classic girls list! What about Joshua? Is that more recently popular? I know about half a million Joshes but I guess many are between the ages of 20-40. Classic, yet still somewhat vintage, is my style for both boys and girls! We have a 4 month old Theodore Stephen, nicknamed Theo. I think Stephen is also a classic and should be on this list! I’d also add Mark. Top picks for a 2nd boy are Samuel “Sam,” Nathaniel “Nate,” Charles, John “Jack,” Louis, Benjamin “Benji.” Also, this post has made me look at David with a fresh perspective. We have a little Arthur, and Simon is on our short list for baby #2! 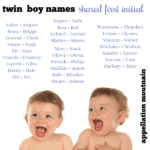 We like classic boy names that lean slightly British, apparently. 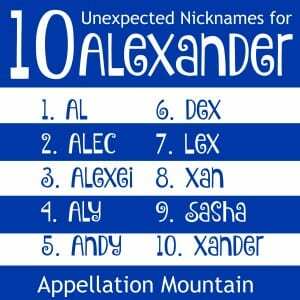 The only other name I would add to this list is Xavier. 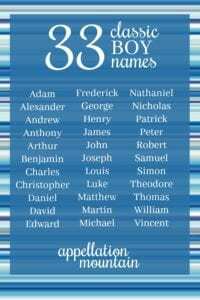 As much as I love unusual names, I have a huge soft spot for Adam, Daniel, William, Anthony, and Nicholas. 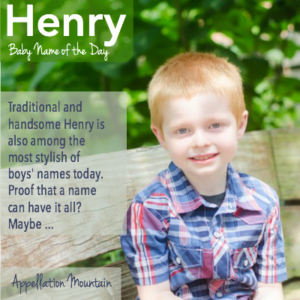 Classic Names are my favorites for boys! I have a soft spot for Andrew and Benjamin.